digital scale, BMI scale, waist high scale, 499KL, buy. 500 Pound Capacity - SHIPS FREE! Waist High Digital Scales by Health o Meter feature an easy to read waist high display. Waist high scales promote ease and convenience in storage and reading the display. The 1 Inch LCD screen allows for viewing measurement both of weight and BMI (Body Mass Index). Health o Meter scales are versatile for many patients. One useful feature for this scale is a pound to kilogram converter and a pound/kilogram Lock-out. The Zero Out/Tare button allows zeroing out of the current weight, so that measurement can be made of any subsequent weight that is added. The Hold/Release button keeps the currently displayed weight on the screen after stepping off the scale. The scale also comes with Auto Zero and Auto Off functions. The USB connectivity allows for interface with a computer, EMR software, and other electronic devices, allowing for the transfer of information from the scale to your computer or other device. This is ideal for patients bringing the information to their doctors, or for clinical use. 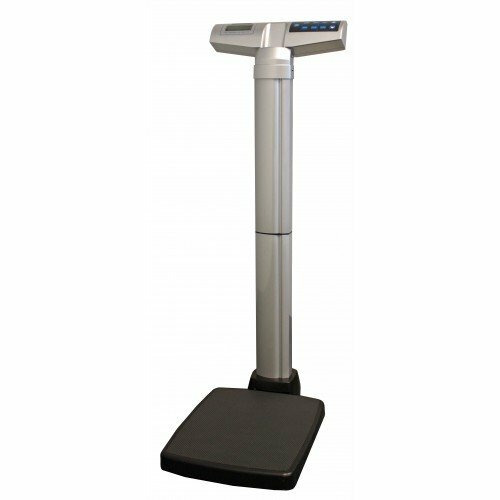 The Digital Scale has a 500 lb (220 kg) capacity, with two wheels allowing for ease of movement. These waist high scales require 6 AA batteries (included) or an optional 120 V adapter (not included). These digital scales also have a 2 year limited warranty. USB connectivity, to interface with computer, EMR or other electronic device.